fltkmm (FLTK MasterMind) is a game of simple logic. MasterMind can be bought as a board game from toy stores (I don't remember who holds the trademark.. I lost my one). 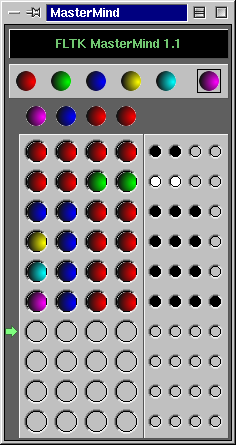 Here's how this game work: Computer generates a secret code by choosing four colors randomly from six colors. Then you guess four colors, computer gives score for your moves. You look at the score and try to figure out the code with minimum number of moves. You need to download source if you you are on Linux/Unix (as well as the fltk). You can download and use the compiled binary for MS Windows. You do not need to compile anything, just download fltkmm.exe. Note: you must have MS Visual C++ installed. It can be compiled without MS Visual C++ too, but you've to do it yourself (read fltk docs on that). 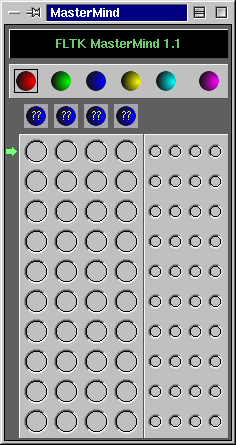 Note: the colored balls are created using gimp on Linux. If you like this game, please let me know. Bug reports, suggestions are always welcome. The computer makes a secret code with four colors picked from the six colors at the top of the window (same color can repeat). Your goal is to find the secret code with minimum number of moves using simple logic. Start by guessing four colors (Pick the color from the top row by clicking on the ball). The computer will give score for your guess with black and white pegs at the right side of the window. One black peg means one color is correct and also it is in the right position. One white color means one color is correct but it is in the wrong position. Note the scoring pegs do not indicate any order of the guessed colors. To see the rules, press right mouse button and then select Rules. To reset the game at any point, press right mouse button and then select Reset from the menu. Pressing Escape will close the game. MasterMind is a trademark of ?? A free cross platform toolkit (written in C++) called FLTK (Fast Light ToolKit) is used in order to make fltkmm run in Linux/Unix and Windows. You can get it from http://fltk.org/. I play with almost all freely available cross platform toolkits, I find fltk is the cleanest (and very fast) of all. And most of all, lots of fun to code with. I'm not a fan of GUI builders but FLTK has a gui builder called FLUID (Fast Light User Interface Design) which I actually can use. Please visit my fluid_hack page.